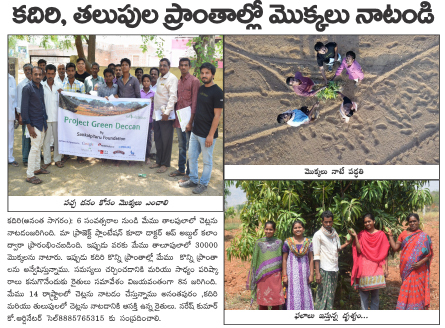 What could be better than a good word of mouth extending the outreach of our green mission! A huge shout-out to our diligent team for their constant efforts towards bringing more and more greenery to the nation. SankalpTaru Foundation had been operational in Talupula village of Andhra Pradesh for over 6 years now. The organization is supporting rural farmers by helping them in planting fruit-bearing trees on their lands. Also, to encourage the rural farmer community, they conducted farmers’ meet for resolving cultivation related issues. 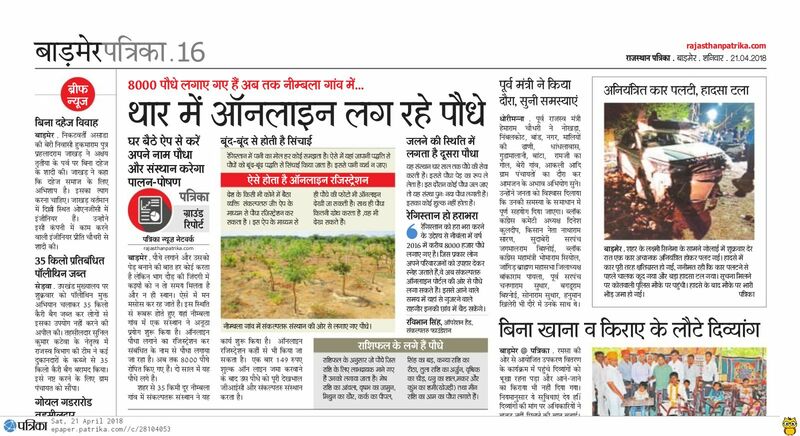 SankalpTaru has initiated a distinctive green program in Neembla village of Barmer district, Rajasthan, where anyone sitting across the nation can plant trees online or gift a tree to their beloved ones. Just with a minimal contribution of INR 149, the trees could be planted here and SankalpTaru nurtures the trees further for next four years. So far around 8,000 trees have been rooted here and in case of any mortality, the damaged plants are replaced with new saplings. The initiative is a pledge to greenify Thar desert with healthy foliage. Through their online platform of planting and tracking trees through Google Earth maps, SankalpTaru enables tree plantation with the click of a finger. The initiative is simply trying to reduce the gap between an individual’s desire to improve environment and the physical action required to make it happen. With the help of SankalpTaru's rural coordinators in AP, Rajasthan, Maharashtra, Leh Ladakh and in other regions who work with progressive farmers, students and other beneficiaries, the NGO plants the saplings, labels them, tags and photographs them. Also, so far they have planted 255,000 trees and are fostering them with a healthy tree survival rate of 95-98%. SankalpTaru Foundation has enabled the ease of planting trees through their web portal. The initiative is spreading greenery in Chokhla, Goliya and Jetmal villages of Barmer district in Rajasthan, where more than 25,000 trees of several species have been planted. 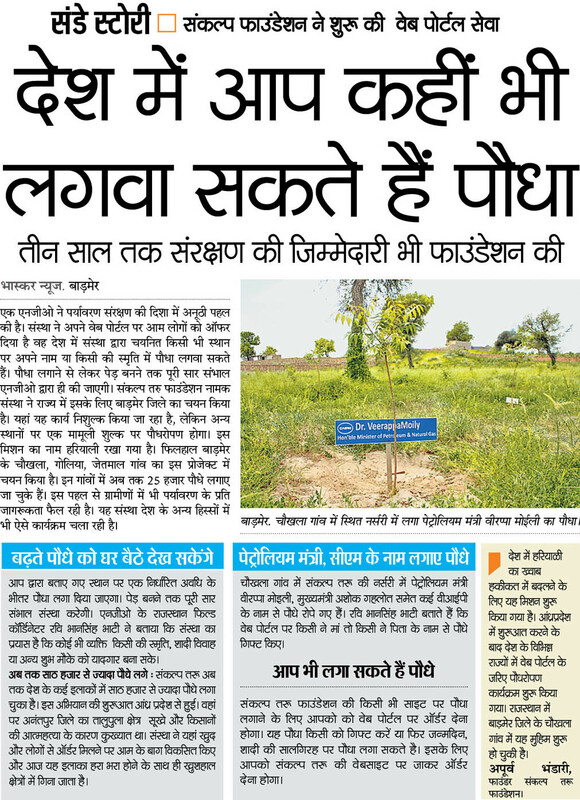 Through this, not only the natural flora is being rehabilitated, but also the rural dwellers are being enlightened about environment conservation. 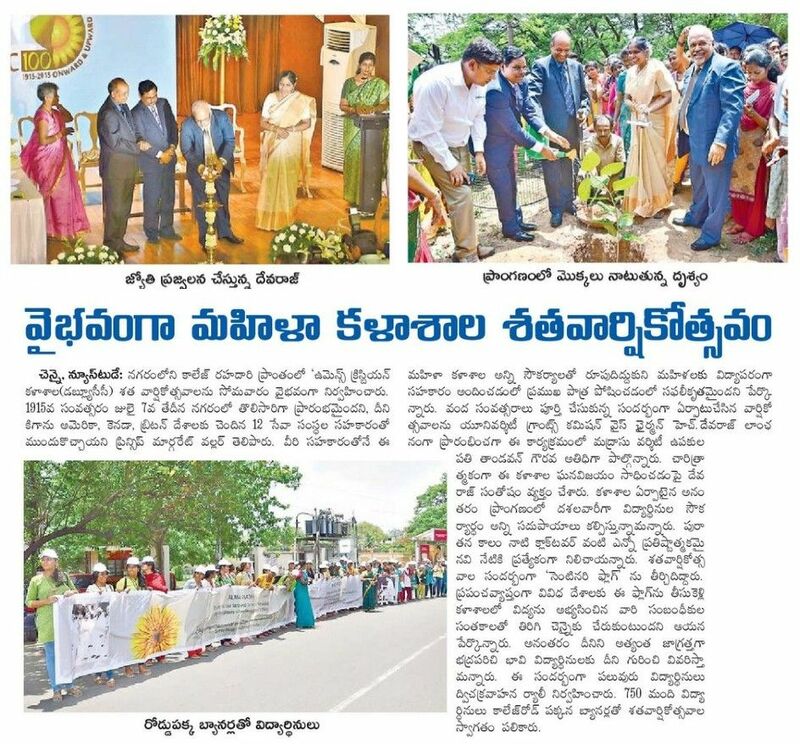 Trees were also planted on the name of Dr. Veerappa Moily, Minister of Petroleum and National Gas. 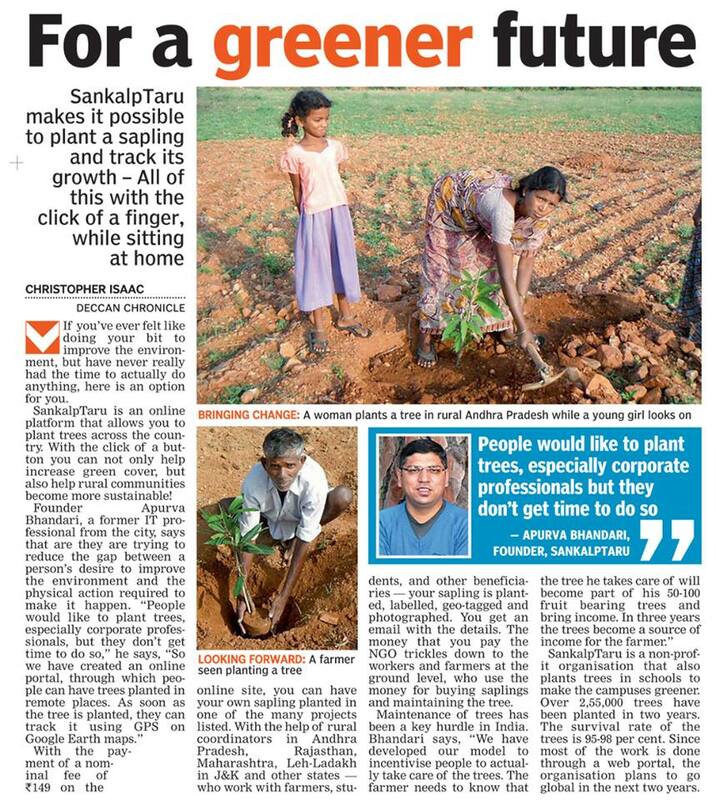 Further to nurture the saplings into healthy trees, SankalpTaru has taken the charge of regular maintenance. Innovatively integrating technology with nature, SankalpTaru allows people with no time or space to plant trees and contribute their share towards the environment. Around 25,000 people have used the SankalpTaru web portal to plant trees in the present 6 locations provided by the organization across India. The initiative is efficiently connecting individuals with nature and also helping rural communities in strengthening their livelihood, alongside. During the monsoon, 85 trees of several native plant species were rooted in a residential society in Pune. 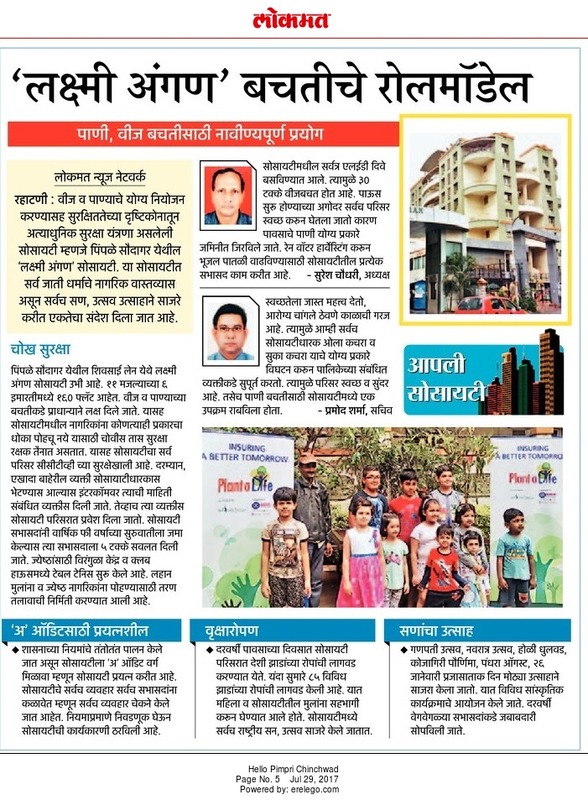 Enthusiastic residents, including kids and women participated in the plantation drive and pledged to the nurture the saplings regularly. This will not only fight the pollution issue of the area but will also create a healthy and green surroundings for the city dwellers. On the occasion of centenary year celebrations of Women’s Christian College, a virtual tree plantation programme was initiated for the college alumnae. Backed by SankalpTaru Foundation, the initiative allowed college alumnae settled across the nation and world to plant trees online. SankalpTaru Foundation and Cairn India organized a workshop with students of State High Primary School in Barmer. Under their Clean & Green School program, the teams educated students about water harvesting through science kit, where the enthusiastic kids also participated actively to learn about environment conservation techniques.